Well kidlings, it's time for another round of "You Can't Make Up This Stuff," the game based on my brother Big Rob's theory that reality is stranger than any fiction. As usual, when we play this game we begin with an item that relates to Big Rob's stomping grounds of Flint. There is a bit of humor in this, but when you think about it there could be an “editorial comment” embedded therein. What if everyone in the state did the same thing? It would sure send a message to our fearless leaders about the “lip service/no service” road repair plan they passed a while back. The only problem is that the state's greenhouses would sell out in about five minutes because the demand would outstrip the supply. With Miracle Whip on the mind, the next logical thing about which to think is sandwiches. “Mens Health” magazine just published a list identifying the most iconic sandwich in every state. These included some taste-tempting treats: Fried Bologna (Arkansas), PB and Huckleberry Jam (Idaho), and the Fluffernutter (Massachusetts). Minnesota claimed the Walleye Sandwich. So what is Michigan's sandwich? The totally boring Ham Sandwich. Now you know why Michigan doesn't get to sit with the cool states in the cafeteria. The whole list is at: https://www.menshealth.com/trending-news/g22690917/best-sandwich-shops-us/. Many states have similar oddball statutes. In Alabama you can be arrested for having an ice cream cone in your back pocket. A Chicago, Illinois law “states that you may not eat in a place that's on fire.” If you're hungry in Washington, there are some places where you won't find a vending machine because it's against the law to attach a vending machine to a utility pole. More of these at: https://www.menshealth.com/trending-news/g22690372/crazy-state-food-laws/. Finally, if you attend a concert or sporting event and find you can't afford snacks because the tickets cost so much, there may be a reason. 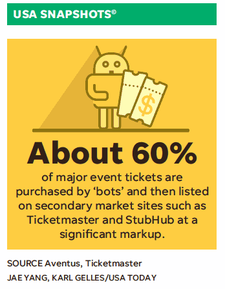 According to Ticketmaster, About 60 percent of major event tickets are purchased by “bots” and then listed on secondary market sites at a significant markup. If the bots are buying up Detroit Lions tickets they may experience shorted out circuits on a regular basis.